2) Drive through Joseph and you will come to the north end of the lake and the County Park. 3) Drive approximately 5 miles along the lake shore. You will come to a Y in the road. 5) After taking the Y you will see our sign "Wallowa Lake Resort" on the right. 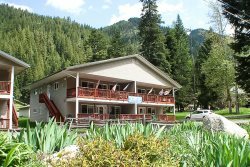 6) Park in front of our little red building which is the Wallowa Lake Resort office.